How Our Process Works Getting a solar PV system is easier than you may think. Below are the general steps involved from conception, to commissioning and beyond. Site assessment A sales consultant from Winona Renewable Energy LLC will perform a preliminary site survey using our comprehensive online site assessment methodology. Upon the review of the preliminary results, you have the option of continuing with a free detailed on-site shading analysis and proposal. On-Site Shading Assessment We use a special electronic shading tool that will accurately measure the shade free percentage of any area. This will take the guess work out of finding the best sunny locations to give the best Return On Investment. This is very important as this shade free information in needed to give you an accurate Return On Investment. Payback Estimate Using the shading numbers as well as other information regarding your location, we will then calculate the payback and Internal Rate of Return percentage (IRR) and will go over these numbers with you. Should these look good, then the next step is the Proposal. 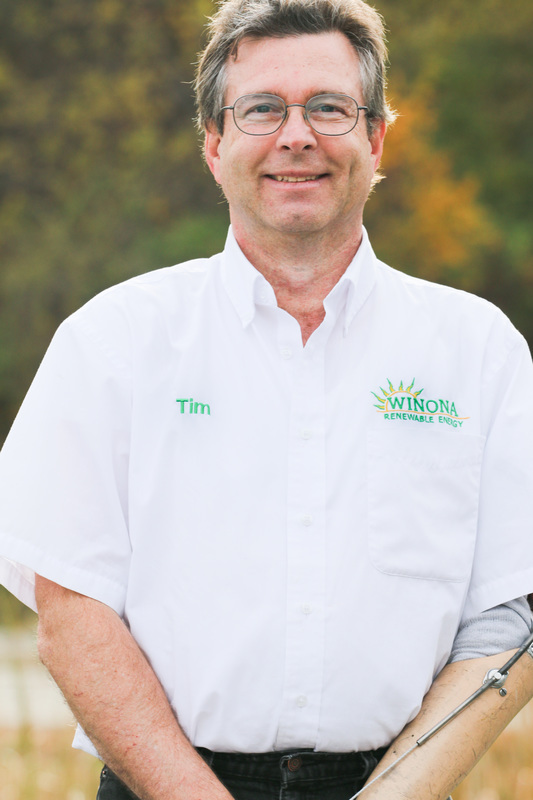 Proposal Your Winona Renewable Energy LLC sales consultant will provide you with a detailed, written proposal that addresses how your goals will be achieved. Included in the proposal will be possible options of different solar module configurations and system sizes, applicable rebates and incentives, financing options, net investment in solar, annual savings, and equipment specifications. Approval Once you have approved our proposal, Winona Renewable Energy LLC will prepare the necessary paperwork. We will submit all appropriate applications for rebates and incentives. Additionally, we can provide you with different financing options, if appropriate. We will then work with you to develop a schedule that meets your time requirements. Project time frame This time varies depending on the size and complexity of the system, but typically, projects typically take 2 to 4 months from contract signing to producing your first kWh. All our MN installations are professionally installed by MN Licensed Electrical Contractors. Customer care Winona Renewable Energy LLC will deliver the customer care package, which includes, warranties, product information, and how to monitor your system so you will be fully equipped to enjoy your new solar PV system. Follow-up A solar PV system provides years of hassle-free service. Maintenance is minimal, to none, due to no moving parts. The service department at Winona Renewable Energy LLC is always on call to support any warranty issues that may arise. 5 Year Warranty on All Our Workmanship! At Winona Renewable Energy LLC we are confident in the products we carry, and we take great pride in providing the highest quality customer service on all our projects. This is why we cover all our solar PV projects with a 5 year workmanship warranty on all our sales. Please give us a call with your questions. We look forward to hearing from you. Click above to find all the recent incentives in your State. Click above to find the real time status of the Solar Electric market. All our MN PV Systems are professionally installed by MN Licensed Electrical Contractors. Certification does not allow for the installation of electrical systems.